Mary Greene is a musician and songwriter and forms one half of the duo Noel Shine and Mary Greene and one third of the trio Greenshine along with Noel and their daughter Ellie Shine. She is the main songwriter for the band who have released two albums to date. The single The Girl in the Lavender Dress taken from Greenshine’s album of the same name reached no.1 in the iTunes Singer Songwriter Chart and was third most played Irish song on Ireland’s premier radio station RTERadio1 for the year of its release. Mary curates the Gals at Play Concert for Cork Folk Festival which features original songs and tunes from a variety of women writers and her own songs have been used in film and in radio ads as well as being covered by other fine artists. Originally from Waterford City, she is now based in the Muskerry gaeltacht (Irish speaking area) in Co. Cork. Her songwriting covers a lot of ground. Themes such as the plight of the outsider, love of family and romantic love feature and her songs are imbued with fleeting glimpses of the little mysteries that lie just below the surface of our everyday lives – the things that make life worth living. Mary emerged from a musical and theatrical family background and has been surrounded by music of all kinds since a very young age. She grew up listening to her parents’ record collection, gathered during the 10 years they spent in America – Tony Bennett, Elvis, Roger Miller, Sarah Vaughan, Chris Montes – just some of the music on the domestic jukebox. Sunday evenings were spent listening to the Top 30 chart with her mother. Her older brother Willie steered her in the direction of much fine rock music and later introduced her to Irish folk and traditional. Her family moved to The Anchor Bar in Dunmore East, a little fishing village, and made it into a premier music venue where she gathered still more influences from a very fine local ragtime guitar player, Gerry Power. It was during her years in The Anchor that she met her future husband Noel Shine. Noel sparked a keen interest in good American folk and country music in Mary which opened up a whole new field of musical adventures. They moved to Cork City and became a regular feature of the Cork music scene before travelling and playing extensively in Europe and the U.S. This period of travel was a wonderful eye and ear opener and these new experiences broadened Mary’s songwriting and view of life. It was around this time that the duo released their first album THE LAND YOU LOVE THE BEST. This collection was voted number 3 in the folk albums of the year by the Irish Times newspaper. A few years later they released their second album UNSPOKEN LINES again to much critical support and airplay which saw them being interviewed by and playing live for Ireland’s top broadcasters including Pat Kenny, John Creedon and Philip King as well as making sundry t.v. appearances. Mary was eventually invited to join RTE radio one for an occasional music series she named NIGHTOWN. 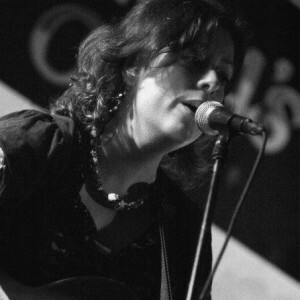 She was asked by the IRISH MUSIC RIGHTS ORGANISATION (IMRO) to present a monthly showcase of original songwriting and music in Cork city which she did for several years bringing, new and established writers to capacity crowds at the infamous folk venue, The Lobby Bar. Her own and Noel’s work featured as part of an exhibition of the history of songwriting in Cork held in the city library for the Cork 2005 City of Culture. Her vocal talents are much in demand in the recording studio and she has sung on albums by many Irish performers including Christy Moore, Frances Black, John Spillane, Declan Sinnott, Mick Hanly and Dr. Strangely Strange. With her own songs stacking up, Mary decided to take the next step and record a solo album SEA OF HEARTS which is being released in the summer of 2006. The album was almost entirely recorded at home with additional recording and mixing taking place in Sonas Studio, Killarney with Tony O Flaherty. It was mastered by Ruairi O Flaherty. Mary got huge input and help on the project from her longtime partner, Noel Shine who played a variety of instruments on the album as well as editing and engineering. Other musicians on the cd include Joe Thoma, Martin Leahy, Ton Nieuwenhuizen, Andre Van Der Hoff, Tony O Flaherty, Sadie and Ellen Shine with a special guest appearance from the Cuckoo. Copyright © 2019 Greenshine - The music of Mary Greene, Noel Shine & Ellie Shine. All Rights Reserved.